The F denotes Lexus’ performance division. 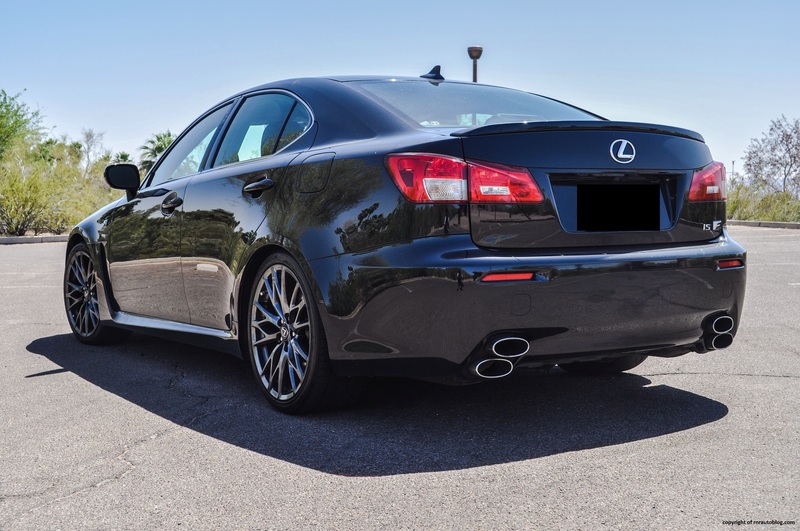 After seeing BMW and Mercedes-Benz with their successful M and AMG performance divisions, Lexus decided that it wanted in on the action. They chose the letter F because it holds a long history with Lexus. Back in the 1980s before Lexus launched in the 1990s, Lexus was marked as “Circle F’ in classified documents by its parent Toyota. The 1989 Lexus LS400 was codenamed the “F1” or the “Flagship”. 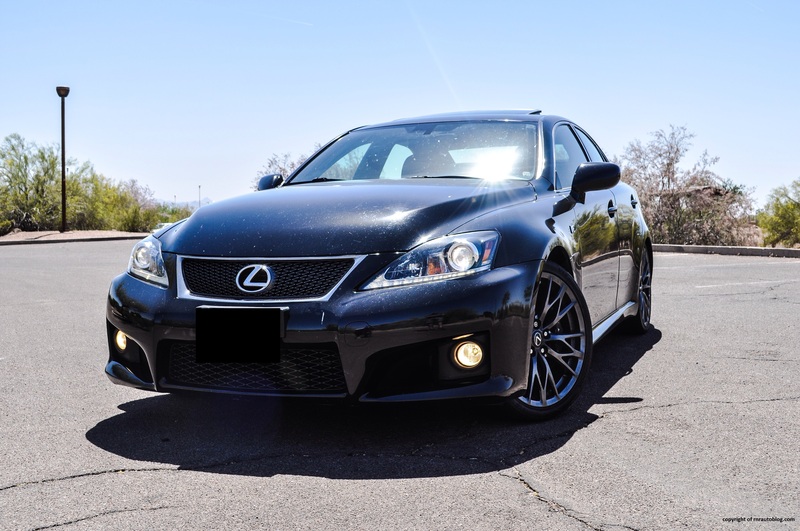 In 2008, Lexus went to work at producing a rival for the BMW M3 and the Mercedes-Benz C63 AMG. 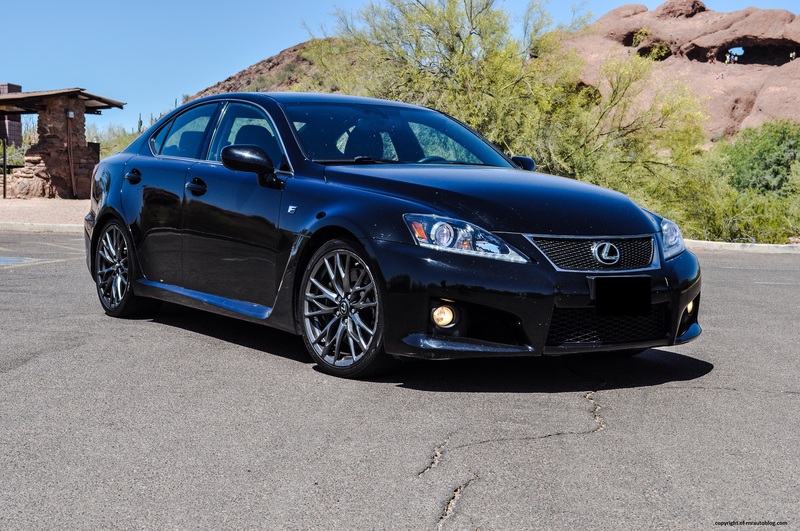 The result of this is the Lexus IS F, which is the performance version of the IS compact luxury sedan. Cool fact: the design of the F in the logos represent the hairpin turns of Toyota’s Higashi-Fuji test track. 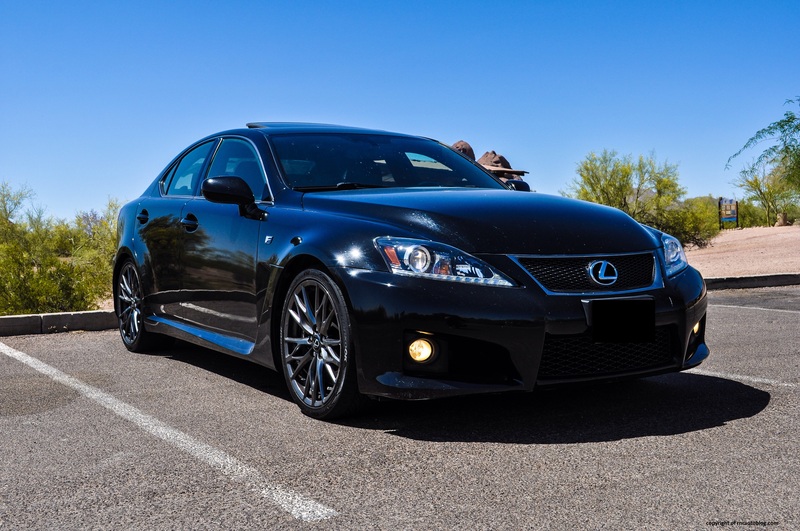 My mother has a Lexus IS250, so I was also curious to see how this measures up, and as Lexus’ first performance car. From a distance, this car looks like any other IS. But look closer, and you notice the aggressive bumper treatment in the front. The flowing hood lines and simple headlights accentuate the aforementioned bumper treatment nicely. Huge bulging fenders and a low stance give the IS F a menacing appearance. The IS F continues the IS’ broad shoulder line deriving from the hood into the trunk. The wheel design is stunning, and the body is thankfully devoid of any gaudy adornments. The vent behind the front wheels is a nice and racy touch. 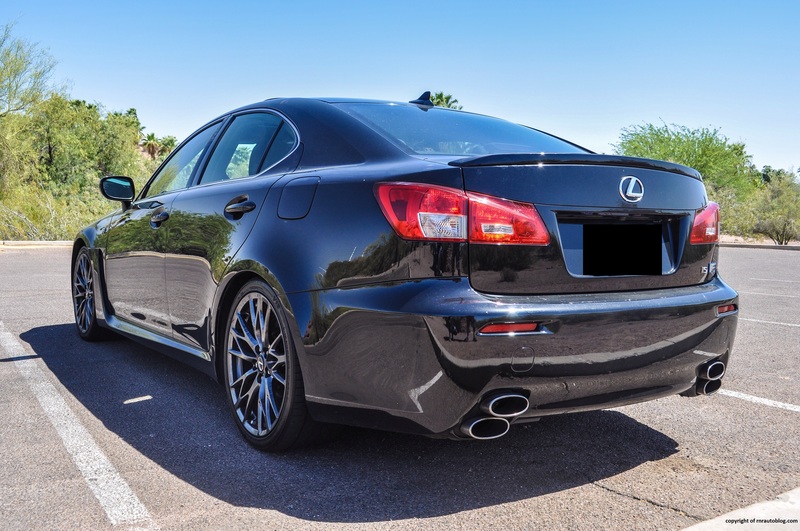 The rear looks exactly like a normal IS except for one thing: the stacked exhausts. Initially, I thought it was stupid to stack them up, but now I actually like it as it is unique. The IS is a gorgeous car, and this IS F continues that without trying too hard with its F specific cosmetic modifications. The interior is carried over from the IS. The brushed metal, blue inserts, and customized gauges lend a sport feel to the interior. I tried my hardest, but I kept comparing this car with my mother’s IS250. With that in mind, the IS F is a completely different animal. 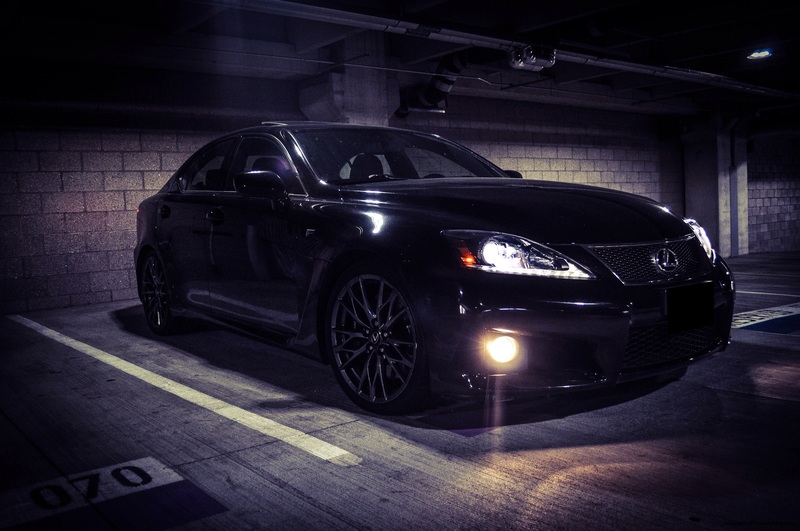 The steering is less artificial feeling than the IS250, but not by much. It feels twitchy in a straight line, but when turning, it weights up inconsistently. There is some feedback, but it is too little in order to be truly informative. But these flaws become minor when you consider the handling. My gosh, it handles very well. There is virtually no wheel travel (suspension travel), so it is not surprising that the IS F corners with no body lean no matter how fast you are going. As soon as you can get past the weird steering, the IS F really comes into its own. You can feel the steering and suspension working in harmony, as the IS F feels well sorted out in its handling capabilities. It never feels like it wants to plow ahead, and it remains balanced in hasty driving. In fact, the rear is eager to slide. Even with the stability control on, I came to a corner and turned fast, and the rear slid out. Sadly, there is a consequence for the IS F’s supreme handling. Due to the limited wheel travel, the suspension is very stiff which translates into a somewhat rock hard ride. Even on smooth roads, it has trouble coping with subtle pavement changes. Braking is excellent. 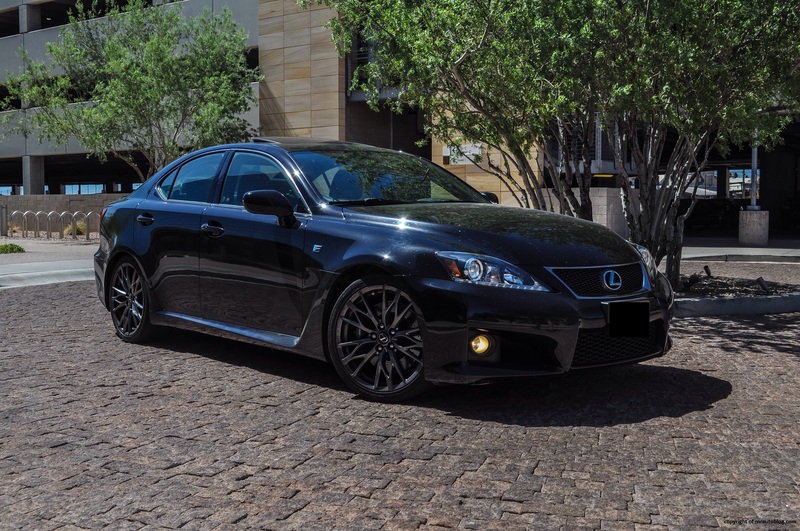 While the regular IS250 and IS350 make do with 2.5 liter and 3.5 liter V6s, the IS F comes with a 5.0 liter V8. This engine was developed with Yamaha, and it pumps out 416 horsepower. 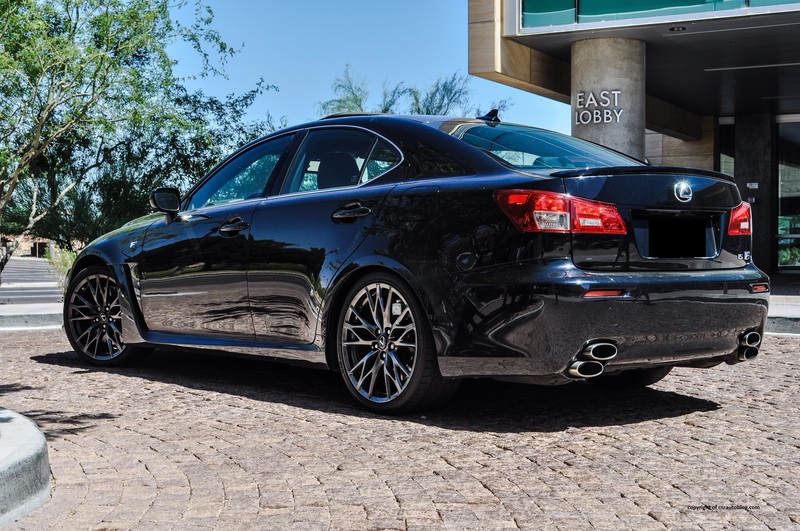 This horsepower rating puts it in line with the 414 horsepower BMW M3 and the 451 horsepower Mercedes-Benz C63 AMG. The V8 provides neck snapping performance. I cannot tell you how much fun this engine is to play with, especially driving onto a highway ramp. Characteristically of a V8, there is enough low torque for you to cruise without much trouble, and it feels strong at any speed. Unique to the IS F version, an eight speed automatic transmission carried over from the LS is standard. 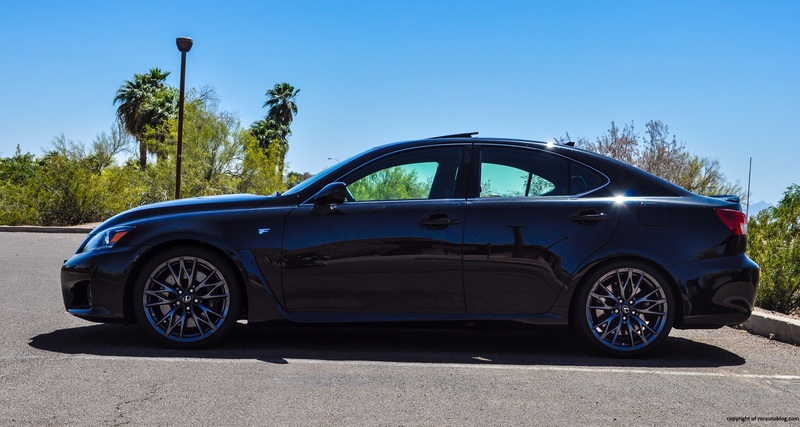 Even though eight speeds may seem too many, it never feels like that in this car. It shifts decisively and without any lag, and the manumatic function and shift paddles work well. 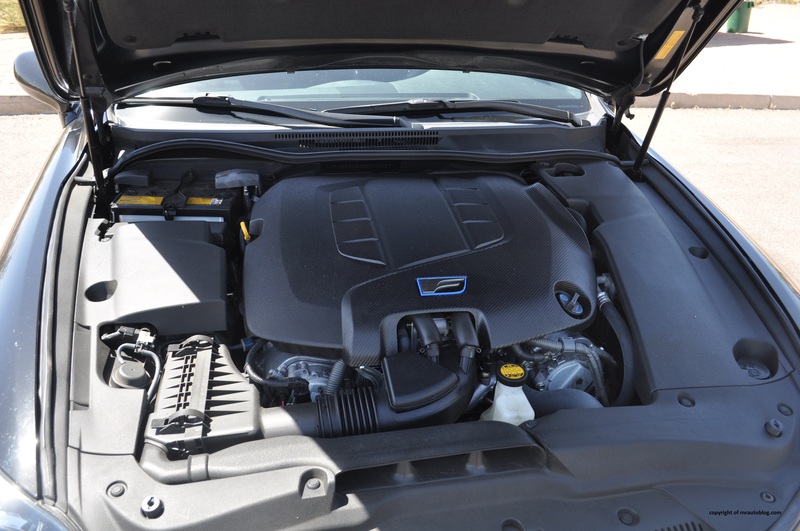 My only complaint regarding this powertrain combo is the absence of a manual transmission. 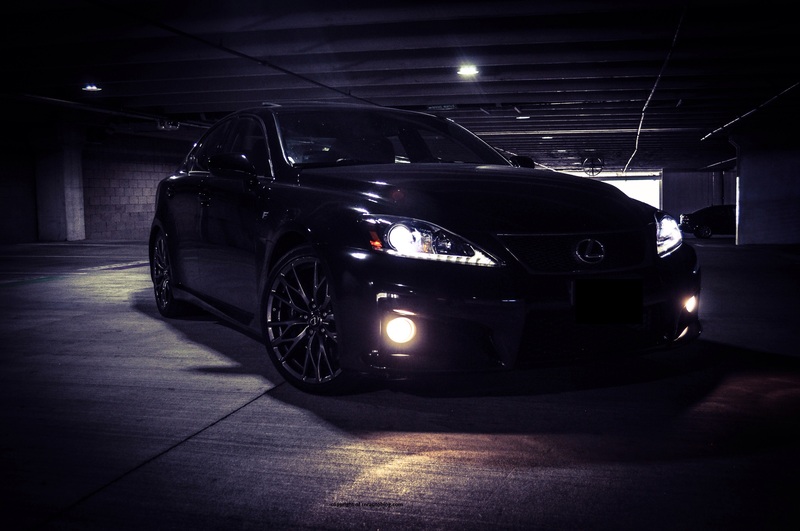 Even though it is a Lexus, a manual transmission would increase the involvement between the driver and the car. One of the best parts about this car is the engine sound. At less than 4,000 rpm, the V8 remains in the background. Go past 4,000 rpm, and it “wakes up” and lets out an exhilarating whine. It is literally music to my ears. I could not resist flooring it just to hear it wake up all over again. Otherwise, it is quiet inside like a Lexus. 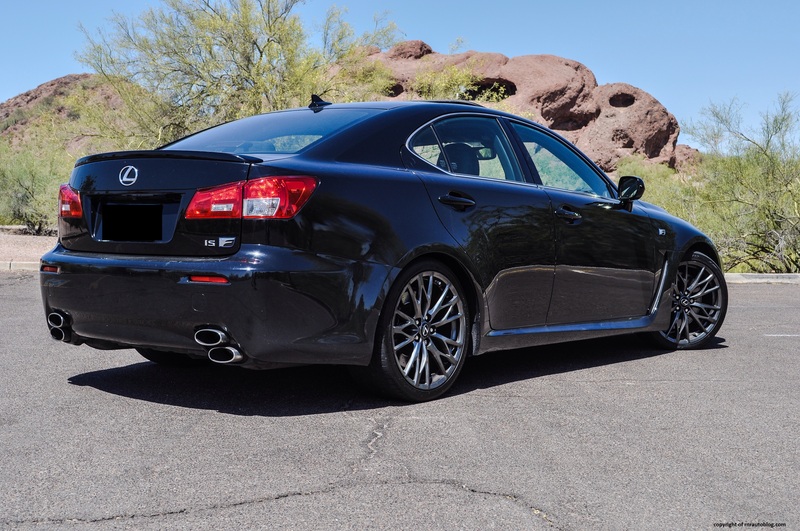 Lexus cars have always had fastidious attention to detail in their cabins, and the IS F is no exception. The cabin feels luxurious with excellent fit and finish. One detail that I absolutely love are the suede seats. I told my mother how the IS F has suede seats, and her response was, “Oh that’s bad, because they get hot in the sun”. The suede seats just make the IS F a thousand times cooler. They are comfortable, and I like how they hug you. The cabin does feel a bit snug, and headroom is not the best in the front or the rear. The center console robs a lot of knee room. The rear is cramped, and visibility is just merely adequate. The trunk is middling also. The navigation has a dated interface and graphics, but there is no denying it is one of the best touchscreens I have come across. 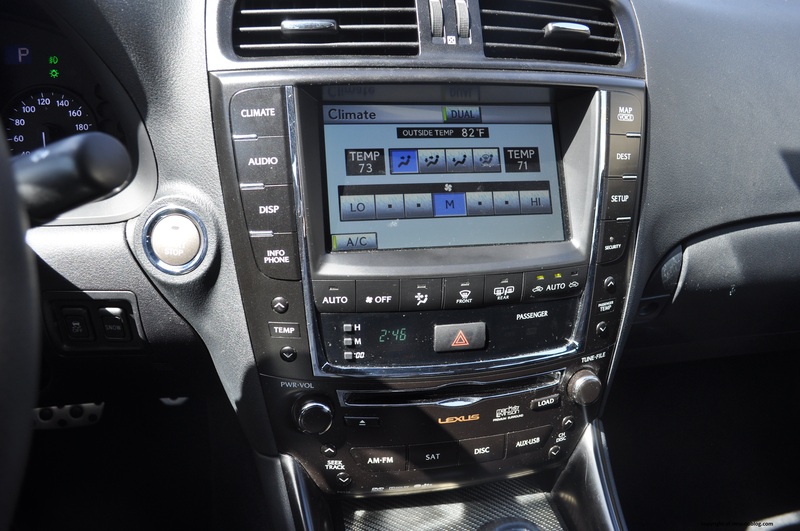 The fact that the AC and radio controls are separate from the navigation system is a bonus. It is easy to find a comfortable driving position. The gauges look cool, but they are illogical. There is a huge tachometer and a tiny speedometer on the right. Granted, there is a digital readout of your speed in the tachometer, but I am one of those guys who prefers analogue rather than digital. And since this is not a manual, the tachometer is even more useless. 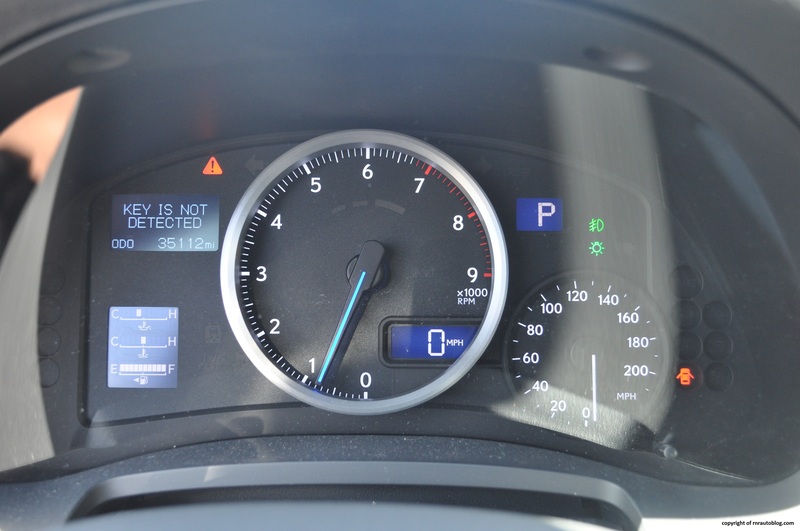 Memo to Lexus: make the speedometer big or equal in size to the tachometer. I’ll have to admit that I was a bit prejudiced when reviewing this car. 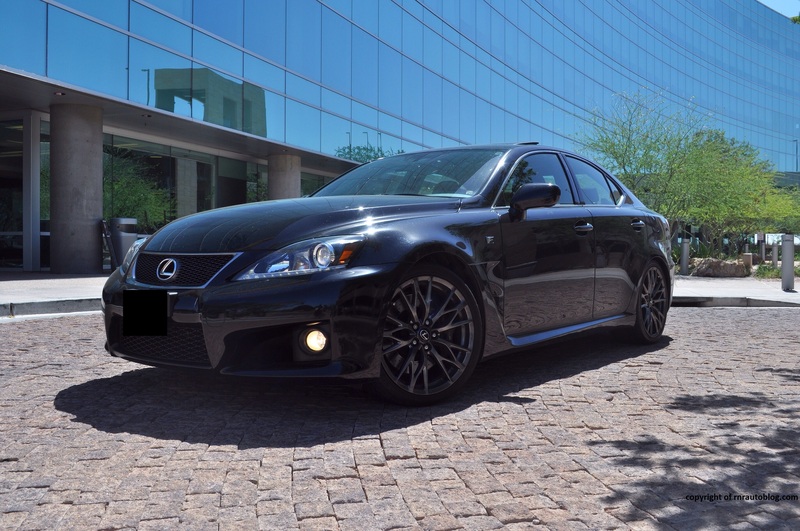 My mother’s 2009 IS250 is gorgeous, but its numb and artificial steering ruins it for me. The steering situation in this car is a bit better, but not by much. But the thing is, this car has a lot of character. Pardon my language, but the M3 and C63 AMG attract…well mostly douche bags, but this doesn’t. 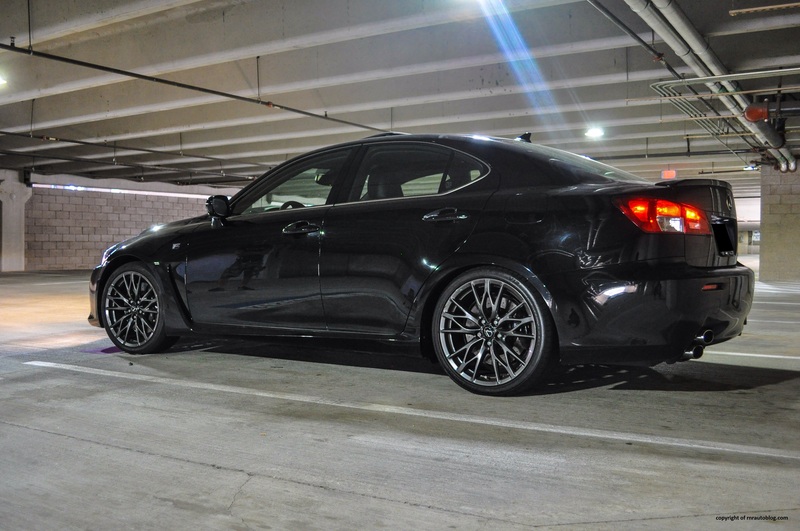 Rather, if you’re into this car, it is because you want something different, and you value performance and handling. What I love about this car is that it is drop dead gorgeous, but it does not scream for attention like the aforementioned cars do. I have a feeling that while those two might be better to drive, I would not be able to enjoy myself in those two cars because of the attention they attract. With the IS F, I am able to focus more on the car, and truly appreciate how great of a car it is. And the suede seats! I honestly do not know why I am infatuated with the suede seats. 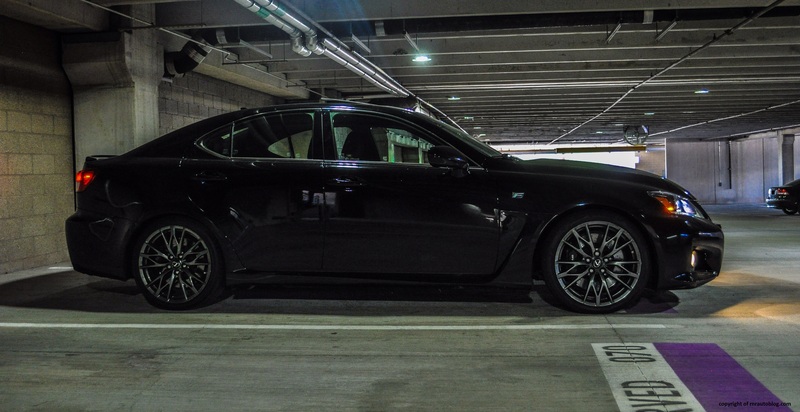 The IS F deserves more recognition, because it is a truly accomplished machine. The IS F makes it cool to drive a Lexus. I do like that car. Very nice write-up on a very sweet car. Truly the appropriate ride if you want to cruise incognito as a hooligan and give a Corvette owner a run for his or her money once in awhile. I sure enjoyed my few days of piloting that baby around. Fantastic pics, btw. Those photos from Papago Park turned out great.